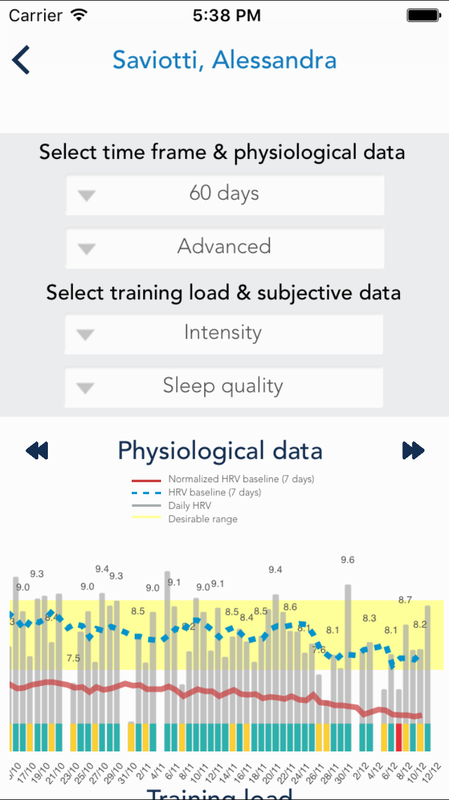 HRV4Training Coach provides access to your athletes' data & insights anytime, anywhere. 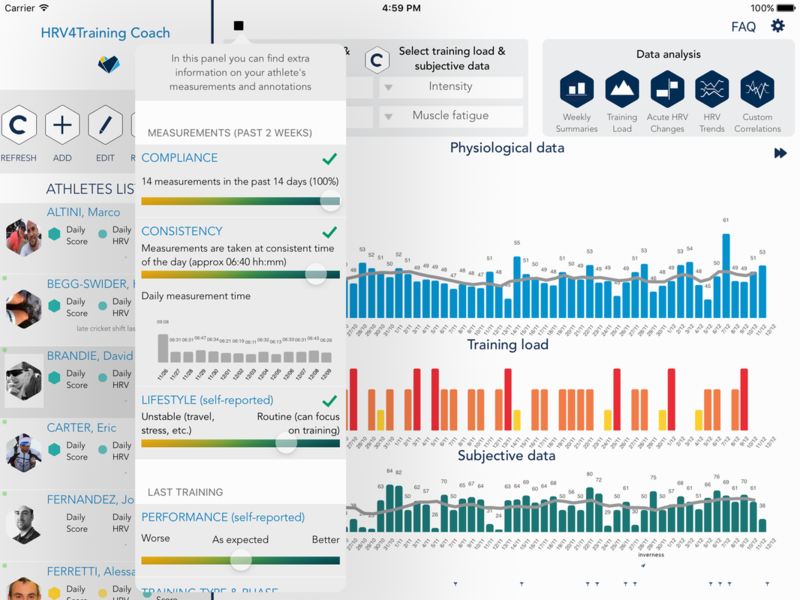 The app is available on iPad and iPhone, so that you can always access and analyze your athletes' data, even offline. 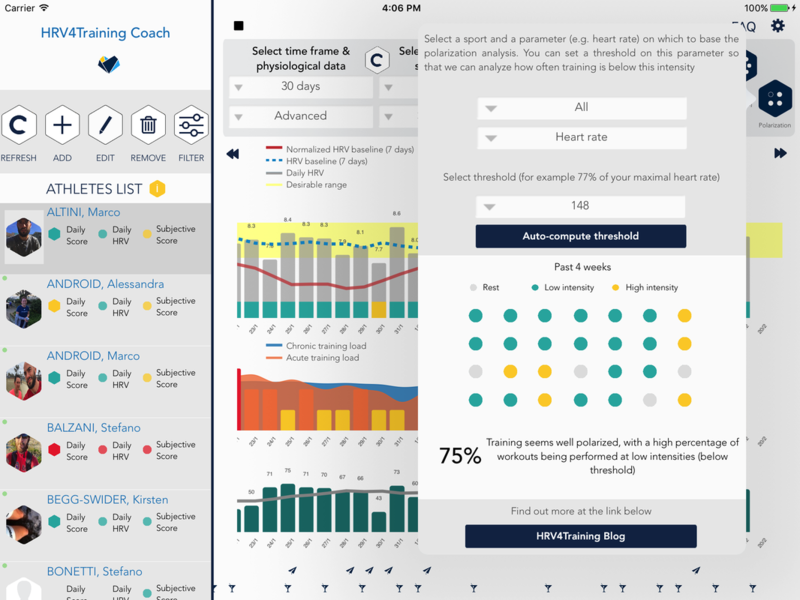 The HRV4Training Coach platform is compatible with client apps on both iPhone and Android and requires a HRV4Training account and a subscription that can be purchased inside the app. Feel free to contact us for a 1 month free trial. 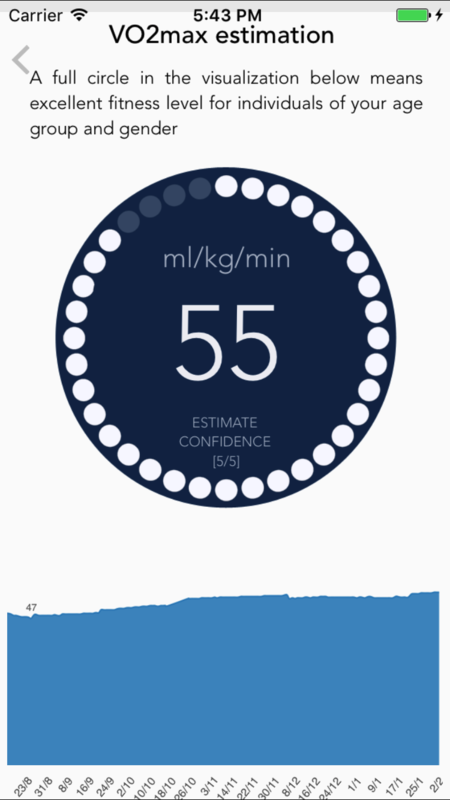 Receive and synch your athletes' data right after they've taken the morning HRV measurement, from iPhone and Android clients. Monitor daily values and deviations from your athlete's baseline and receive daily advice to make meaningful adjustments to training programs. 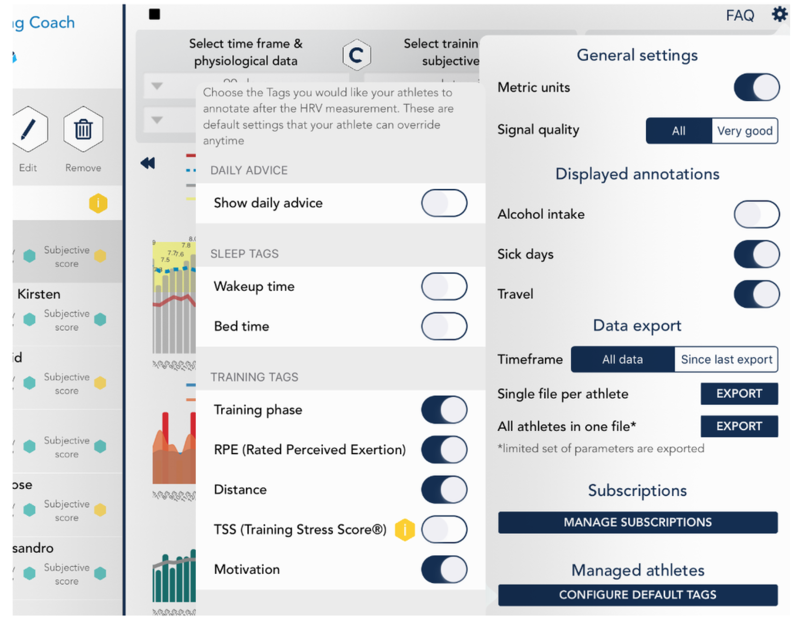 The athletes list provides an overview of the daily advice, daily HRV and subjective score, so that you can get an overview of your entire team and take action without having to go through all the data for each individual athlete. Additionally, you will also be able to see at a glance daily annotations / messages from your athletes. Monitor long term trends to better understand the big picture. 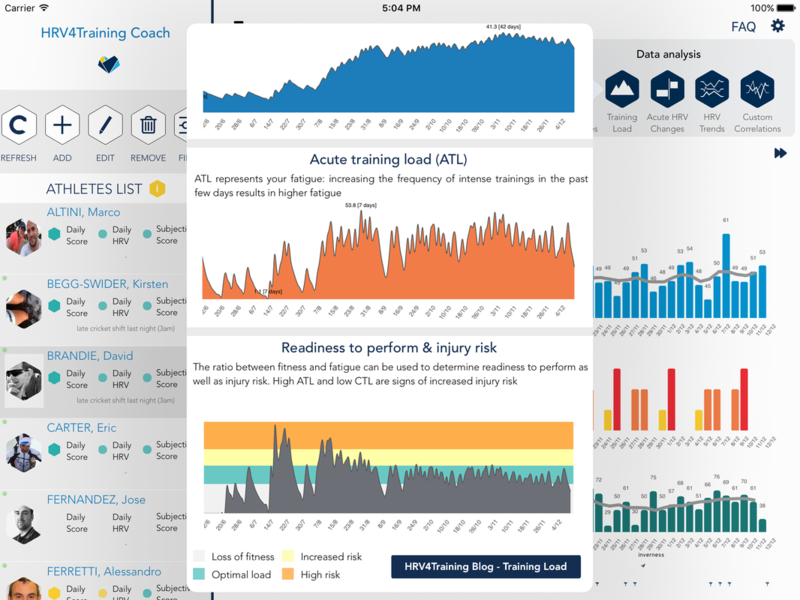 Check out this post for an overview of HRV4Training Coach advanced data visualizations for coaches. 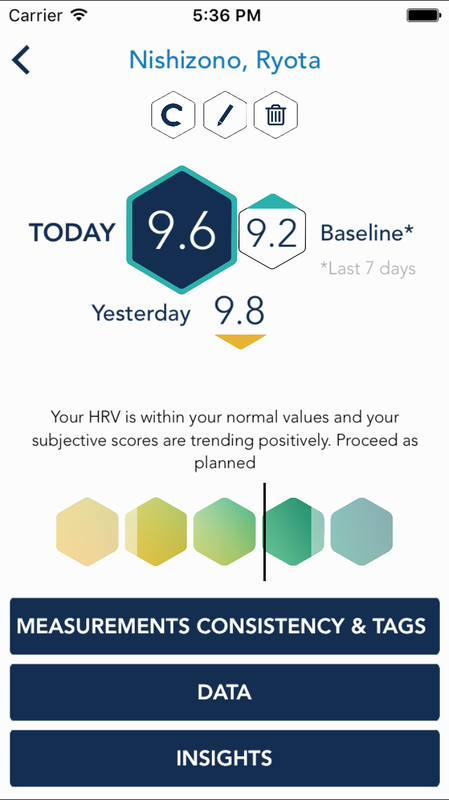 HRV trends: provide more insights on the big picture. Look at baseline changes on multiple parameters relevant to your athlete's physical condition (e.g. HRV, HRV, coefficient of variation, training load), etc. 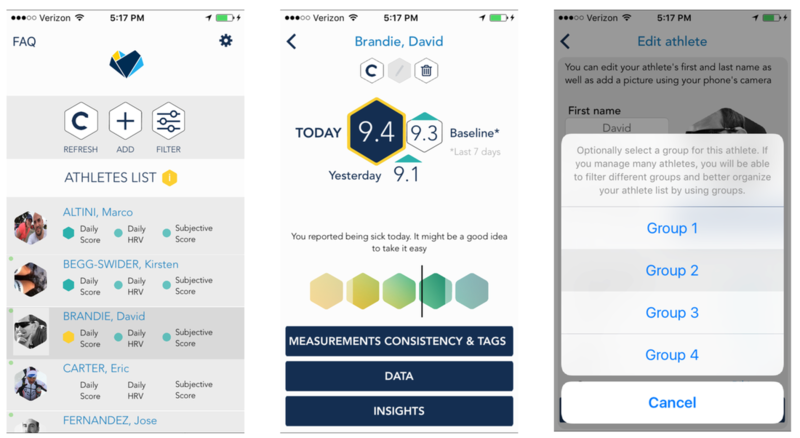 The app can automatically determine if a recent HR or HRV trend is changing in a trivial way, or if the change is something to take more seriously, based on historical data. Correlations: mainly for exploratory analysis inside the app. Look at what factors are related to physiological changes, and try to make adjustments accordingly (a good one is typically sleep quality). Training load analysis: pick the metric most representative of your athlete's trainings (e.g. RPE, TSS, Suffer Score, training distance or your own custom metric) and analyze fitness & fatigue, determined as chronic and acute training loads, as well as readiness to perform and injury risk. Weekly and Montlhy workout summaries: pick the metric most representative of your athlete's trainings (e.g. RPE, TSS, Suffer Score, training distance) and analyze training load breakdowns by week and month to keep better track of overall progress. VO2max estimation: for runners using the Strava integration and training with a HR monitor, HRV4Training can estimate cardiorespiratory fitness level (VO2max). Check out this post for more details and our publication showing a strong agreement between real life running performance and estimated VO2max. Training polarization analysis: This analysis allows you to get an overview of how hard your athletes are training and potentially polarize more their training, as a more polarized approach, typically involving training about 80% of the time at very low intensities, has been shown to improve performance for both recreational and elite athletes. More details on this analysis at this link. Group and filter athletes (see this post for details). 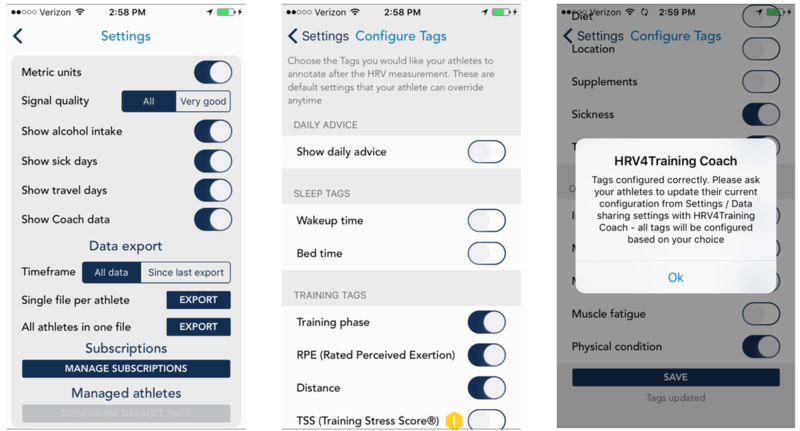 Remotely configure all tags your athletes should be using, optionally hiding the daily advice (see this post for details). HRV4Training Coach can be used as a Pro version of HRV4Training, even for a single user. 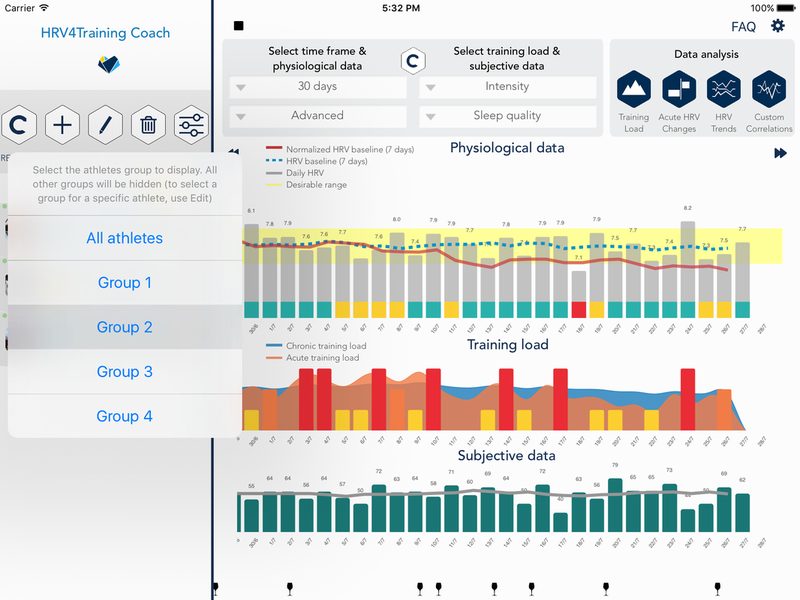 If you are not a coach but would still like to use the platform to explore your own data, you can simply download the app, login with your HRV4Training credentials and HRV4Training Coach will synch all your data and let you use all features as described below. This functionality is available only on iOS at this stage. 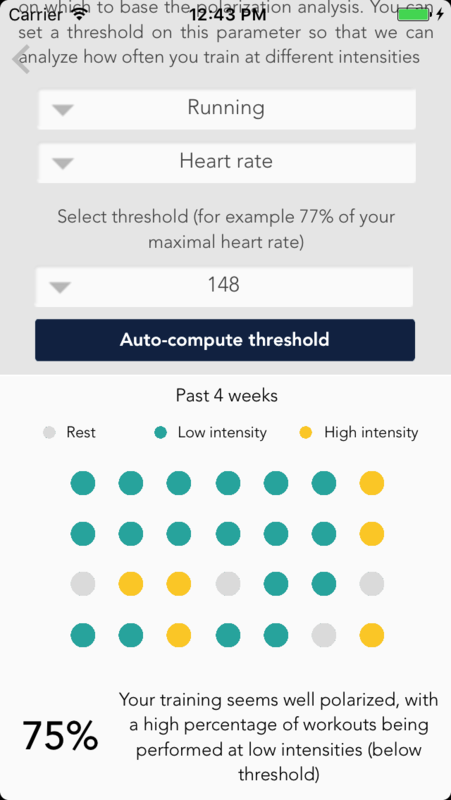 The athletes list provides an overview of the daily advice, daily HRV and subjective score, so that you can get an overview of your entire team and take action without having to go through all the data for each individual athlete. 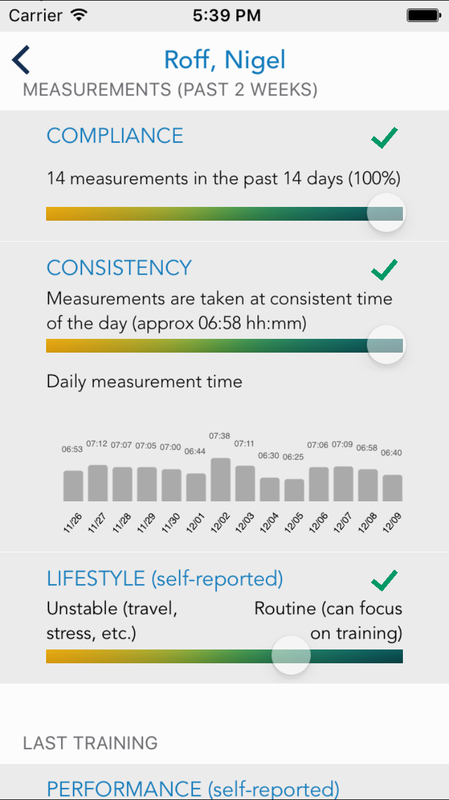 ​The daily measurement value and advice, together with yesterday's score and the baseline will appear in a popup on the iPad version. For the iPhone app, the same information will be displayed on a separate screen, as shown in the screenshots above. The daily advice is the result of a few iterations, achieved through the help of our collaborators, Daniel Plews and Paul Laursen. Dan and Paul are two of the most prominent applied scientists in the field of HRV and training, especially with respect to working with elite athletes. 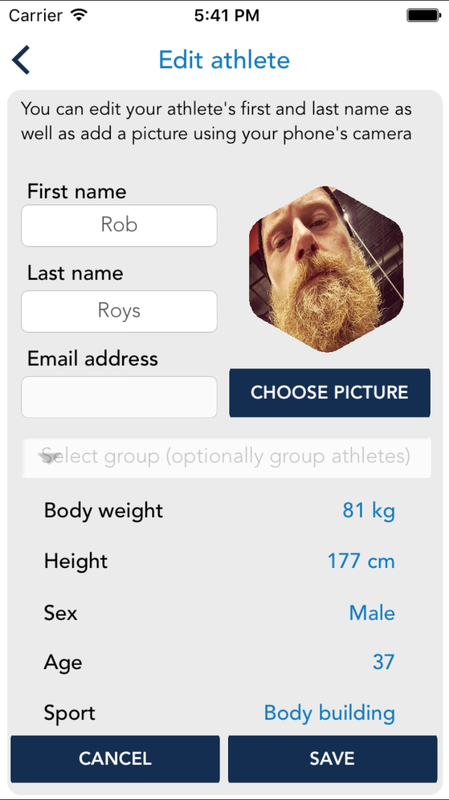 ​We've been collaborating for a few months, starting with a clinical validation of our PPG based algorithms, and also iterating on possible ways to improve the app so that it can be more useful to both recreational and elite athletes. 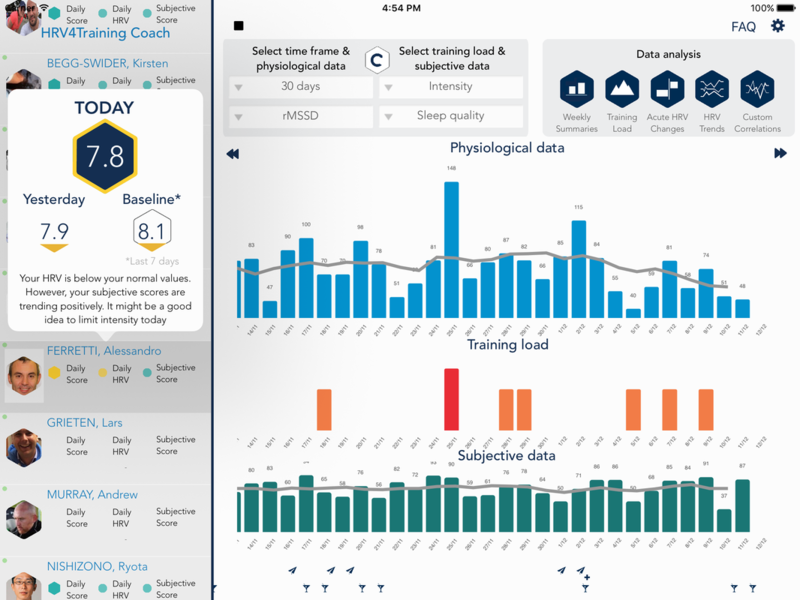 The daily advice combines your past 30 days of data (historical variatons in physiology), today's score, your recent trends and subjective scores to provide your athletes with a green / yellow / red light as well as a short message suggesting a preferred training for a given day. Note that the daily advice can also be disabled if you prefer your athletes not to have this information. As subjective scores, we are currently including sleep quality in the past few nights, motivation to train, perceived performance in your past few training days and muscle soreness. If your athletes don't use all of these tags, we will take the subset they use to compute subjective scores. We chose these metrics specifically as they are the typical ones that predict “readiness to train” the best we find. Finally, for users that collect enough data, we also include your normalized HRV trend to spot particular cases not addressed otherwise. 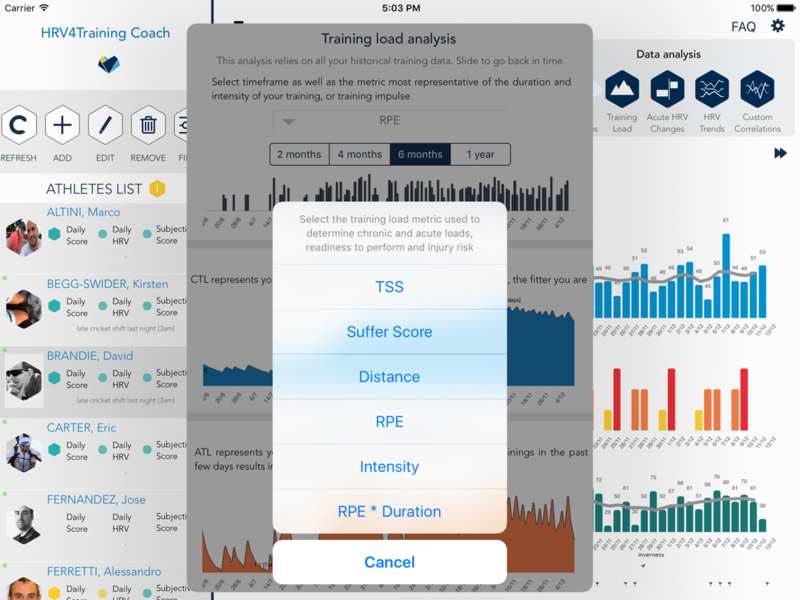 As the desirable range and trends are also included in the daily advice, with time, the app will get better at providing your athletes with daily guidance around training. 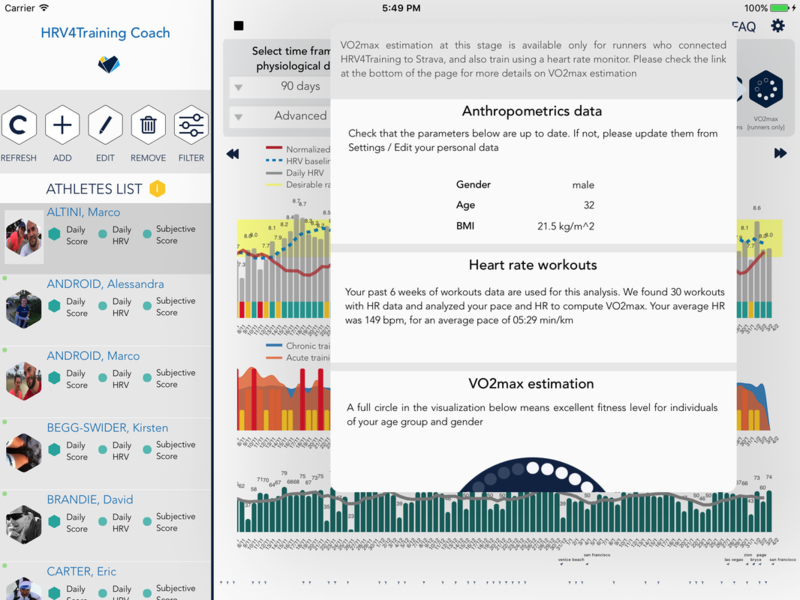 HRV4Training Coach features an advanced view that you can use to ease interpretation of HRV data for your own analysis as well as your team data. 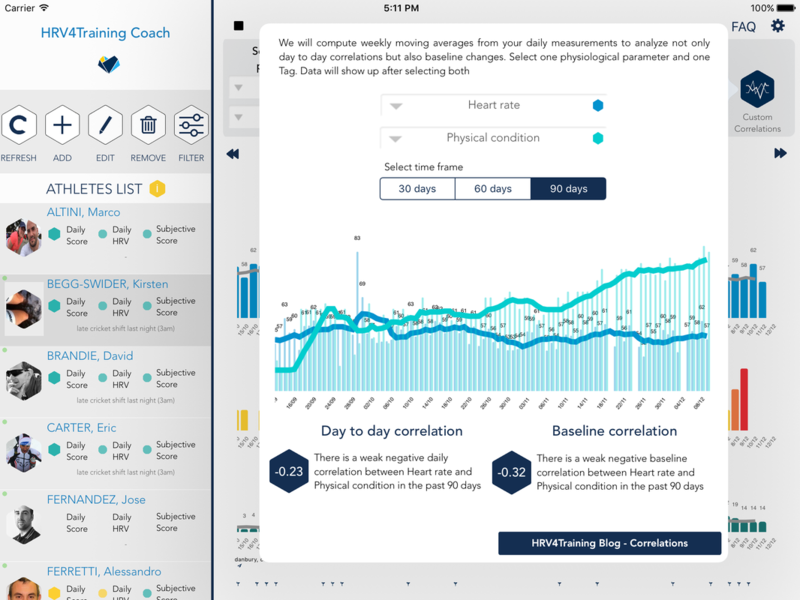 The Coach app shows the daily score, daily advice, desirable range, HRV baseline and normalized HRV baseline. We have also added the training load plot directly to the main view. The first step to understand the advanced view is to understand day to day variability and trends. Your baseline is simply a more stable version of your daily score. It shows how your recent data is looking, but it doesn't say much about what your normal values are, and if your daily score is within your normal values or not. Your baseline could be completely below your normal values on a bad week for example. To solve this problem, we use part of your historical data (30 days) to determine what your normal values are. Your normal values, sometimes called "being within your SWC or smallest worthwhile change", are typically quite a broad range as HRV data changes quite a bit on a daily basis. 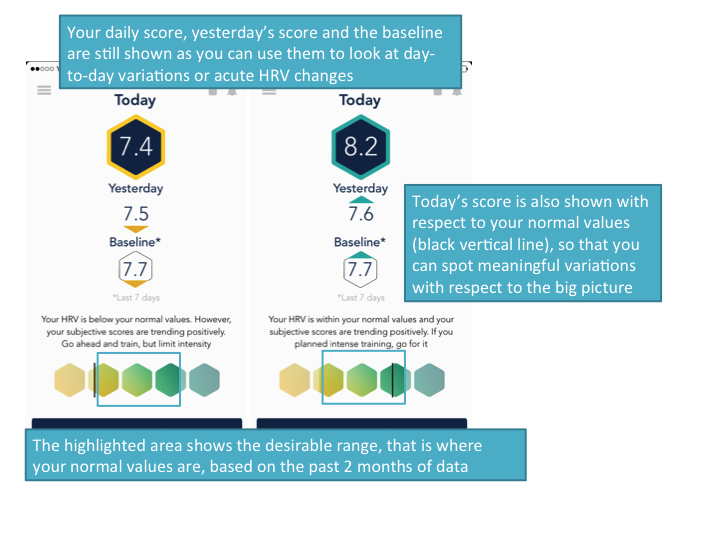 We then look at your daily score with respect to your normal values, and not only with respect to your 7 days baseline, so that we can both analyze acute changes as variations with respect to yesterday and your recent baseline, as well as not loose sight of the big picture, which is defined as your normal values over your past month. This way your normal values are continuously updated and you don't need to worry about setting a specific time frame. Listed above we have the daily rMSSD value, which is similar to your recovery points in the app. We have the rolling average, which is the baseline in the app. And we have the desirable range shown in yellow, which is our "area including normal values". Basically, as long as you are within this area, nothing really has changed in your physiology, from a cardiac autonomic nervous system perspective. Daily HRV: recovery points, based on ln rMSSD, the most commonly used metric in sports science to quantify parasympathetic activity & recovery. This is what you have also in the regular app home screen. 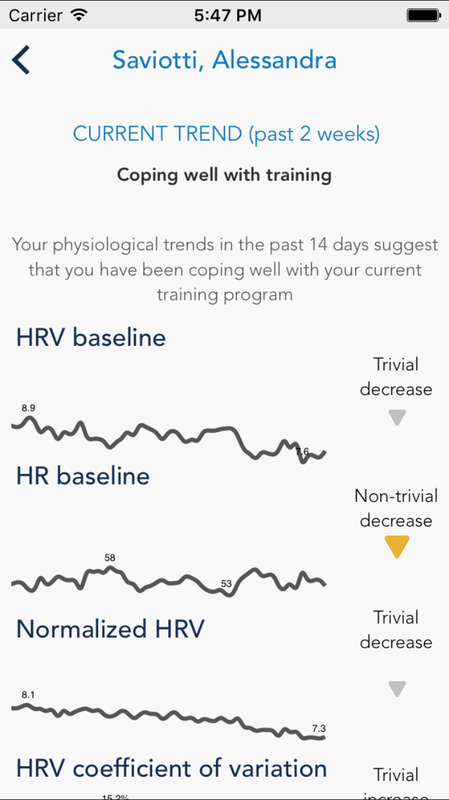 HRV Baseline: 7 days moving average of your recent HRV (Recovery Points). The dashed line shows you your recent trend, and can be interpreted as a more stable marker of how things are going recently, as by definition it is less affected by day to day variability. Typically we aim for an upward or stable trend in this parameter. Desirable Range: highlighted in yellow you can see the desirable range, basically based on your athlete historical data we can determine what is her/his normal HRV range, and hypothesize that anything inside that range is simply related to normal day to day physiological variations, while values outside of this range are the ones to analyze more carefully. We do this also in the regular app, to provide the daily advice. Normalized HRV: normalized HRV (sometimes called rMSSD / RR ratio, basically the ratio between HRV and the average RR intervals, which is the inverse of Heart Rate), becomes particularly useful in certain situations. For example, sometimes HRV might be decreasing, as part of a particularly intense training block, and we might be worried that the decrease is signaling maladaptation to training. However, especially for elite athletes with particularly low HR and potentially saturated HRV, looking at the normalized HRV can shed some light on the low HRV being either no problem because potentially saturated or actually being representative of maladaptation. What you should aim for, is a steady or downwards trend for this parameter, which is what happens when your HR is also stable or decreasing. From this view you can see for each athlete their compliance during the past 2 weeks, the consistency in taking measurements approximately at the same time, a detail view of the exact time the measurement was taken, and a subjective annotation on your athlete's recent lifestyle, which might be helpful in interpreting the data. Additionally, you can find more details on the last training performed. 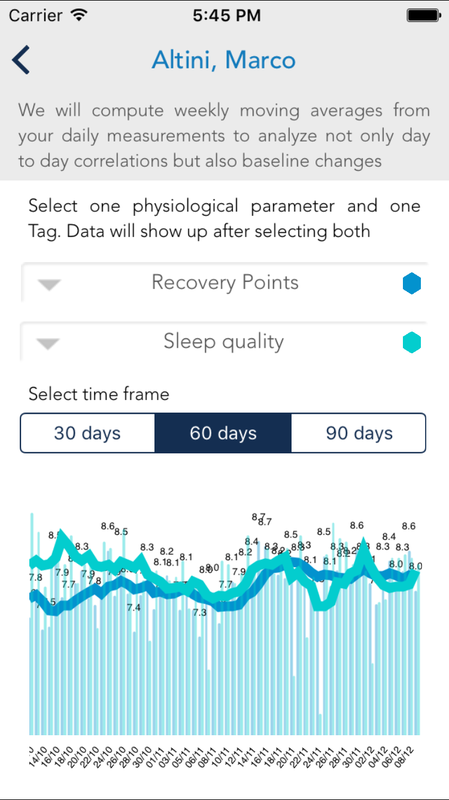 HRV4Training Coach does not provide full messaging between apps, however your athletes can use the daily tags to provide you with relevant information that you can easily see at a glance from the Coach platform homescreen (see for example "stressful day" reported here). On your athlete side, this field is the one named "anything else you'd like to annotate" when filling in the daily tags. 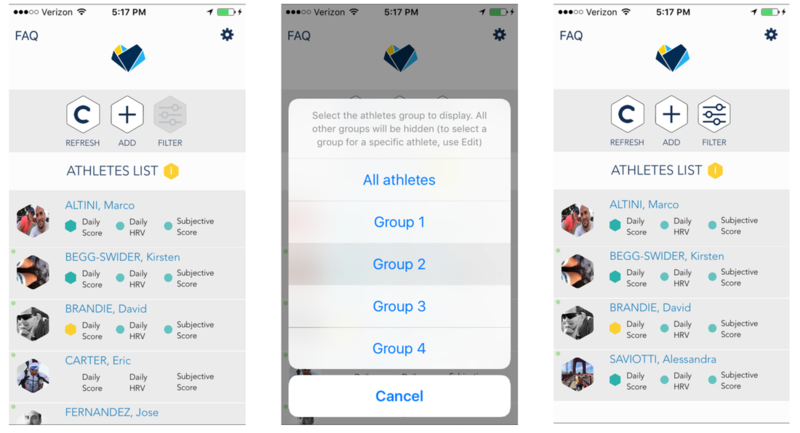 Once you specified groups for different athletes, you can filter them from the athletes list and display only the ones you are interested in monitoring at a specific time, as shown below. 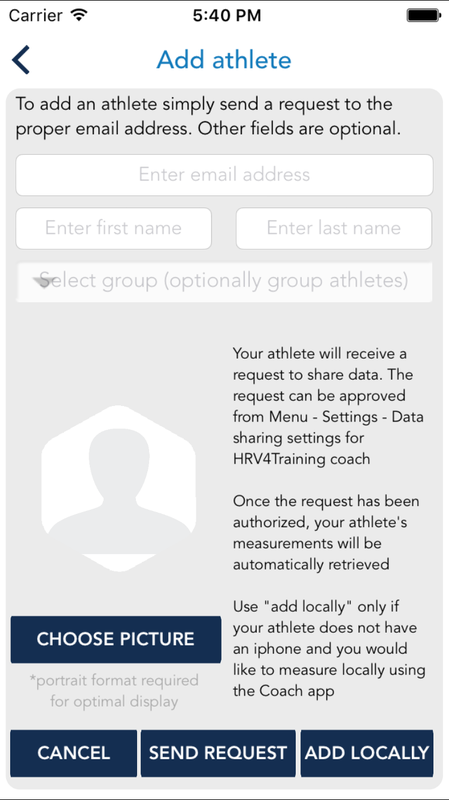 Adding an athlete is as simple as sending a request to the athlete's email address, which can be found in the HRV4Training app under Settings / Data sharing settings for HRV4Training Coach. You can add a first and last name, as well as a picture. 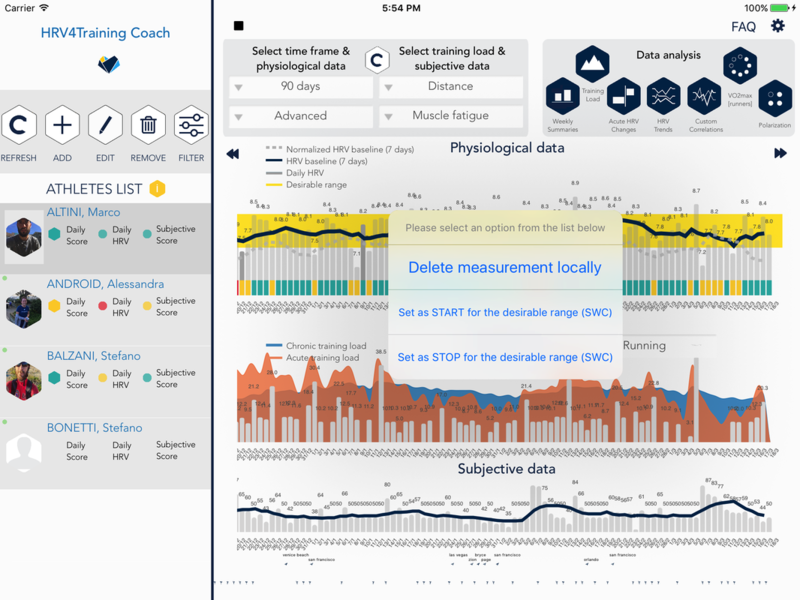 When using the iPhone version of HRV4Training Coach, you can either take a picture or select one from your library. 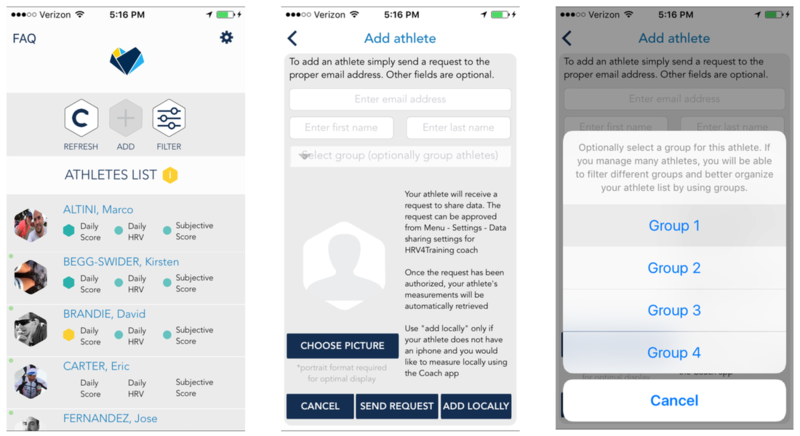 Once your athlete has accepted your request to share data, you can simply refresh the home screen and you will receive and store locally all data. The green circle in the top left corner of each row represents the status of the synchronization with each athlete, so that you know when the request has been approved (green = synchronized, red = request not accepted or the athlete stopped sharing data). 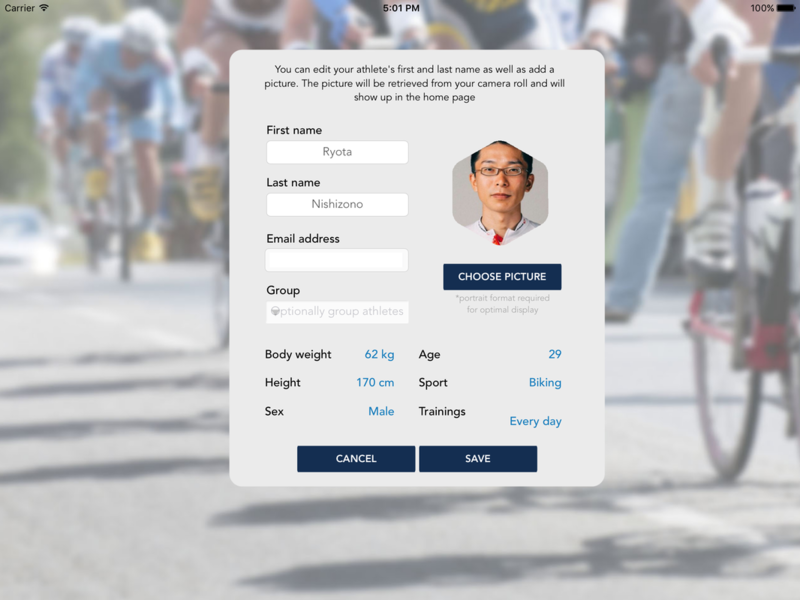 ​After selecting an athlete, you will also be able to see annotated travels, injuries and alcohol intake at the bottom of the plot. All annotations can be filtered and hidden as well. Weekly and montlhy summaries: pick the metric most representative of your athlete's trainings (e.g. RPE, TSS, Suffer Score, training distance) and analyze training load breakdowns by week and month to keep better track of overall progress. HRV trends: provide more insights on the big picture. Look at baseline changes on multiple parameters relevant to your physical condition (e.g. HRV baseline, HRV, coefficient of variation, training load), etc. 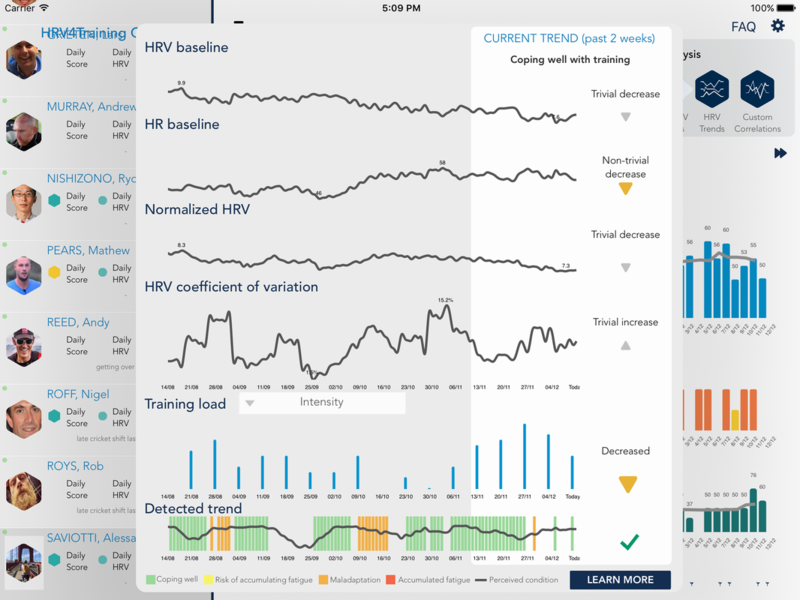 The app can automatically determine if your recent HR or HRV trend is changing in a trivial way, or if the change is something to take more seriously, based on your historical data. 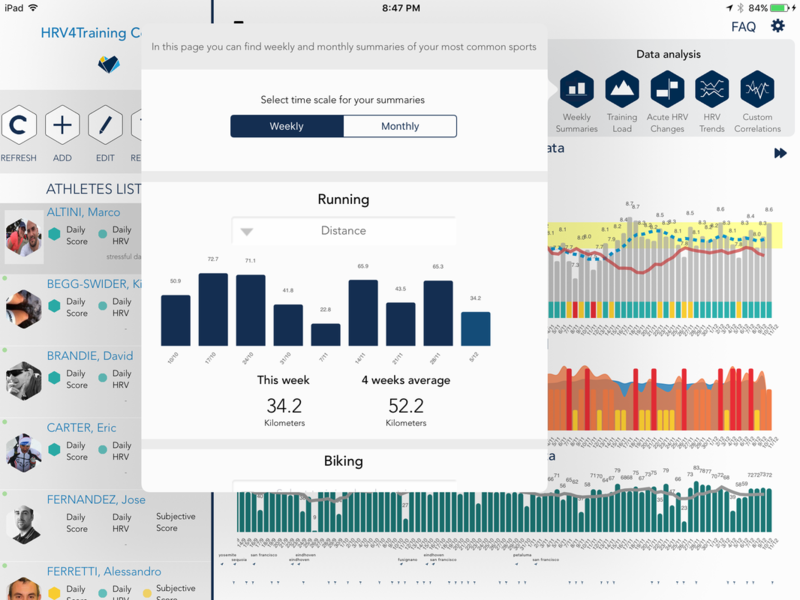 Insights can be accessed via the four buttons on the main screen in the iPad app, and by tapping Insights after having selected an athlete in the iPhone app. Pick the metric most representative of your athlete's trainings (e.g. RPE, TSS, Suffer Score, training distance) and analyze training load breakdowns by week and month to keep better track of overall progress. Pick the metric most representative of your athletes' trainings (e.g. RPE, TSS, Suffer Score, training distance or your own custom metric) and analyze fitness & fatigue, determined as chronic and acute training loads, as well as readiness to perform and injury risk. The app computes also the acute to chronic training load ratio as indicator of injury risk (mainly based on Tim Gabbett's work). This analysis includes no physiological data and it is derived entirely from your training impulse data (basic training unit you use to quantify a workout for yourself or your team). This insight should make it easier to strike the right balance between acute and chronic load (a ratio of 0.8 to 1.3, shown in green, has been suggested in literature) while tuning your workouts based on individualized physiological responses. We compute acute and chronic loads based on quite standard 42 and 7 days windows and the Banister model, in practical terms this model helps you understand if you are doing too much in the very recent period with respect to what your body is used to take, therefore increasing your injury risk. In the Acute HRV Changes analysis you will be able to look at acute changes in two different ways. For certain stressors, which have an impact on the following day physiology (e.g. 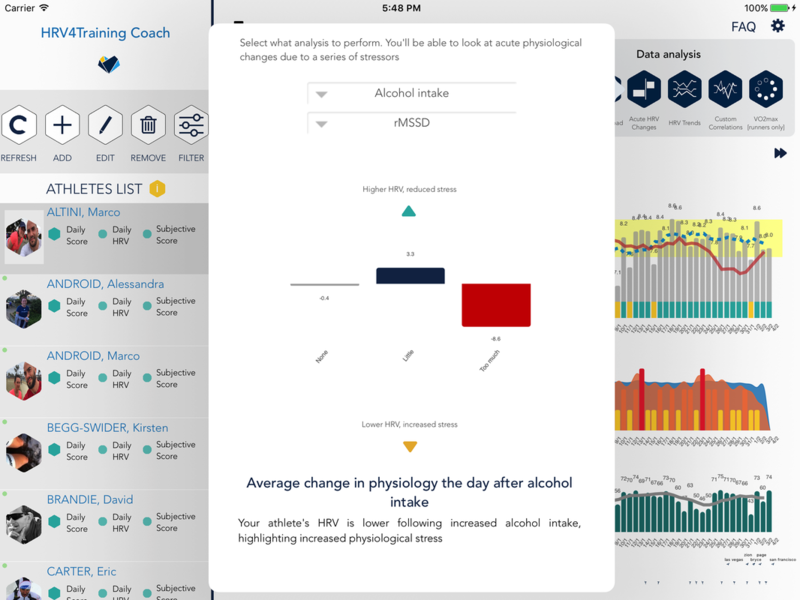 alcohol intake or a workout), we will show you the difference in HRV between "today" (stressor day) and "tomorrow" (day after the stressor), averaged over three months of data. Did your HRV decrease after a certain event? By how much? Is this decrease consistent? That's what you will be able to see for training (rest vs training as well as different annotated intensities) and alcohol intake. On the other hand, some stressors last for several days (for example getting sick, menstruation and travel). 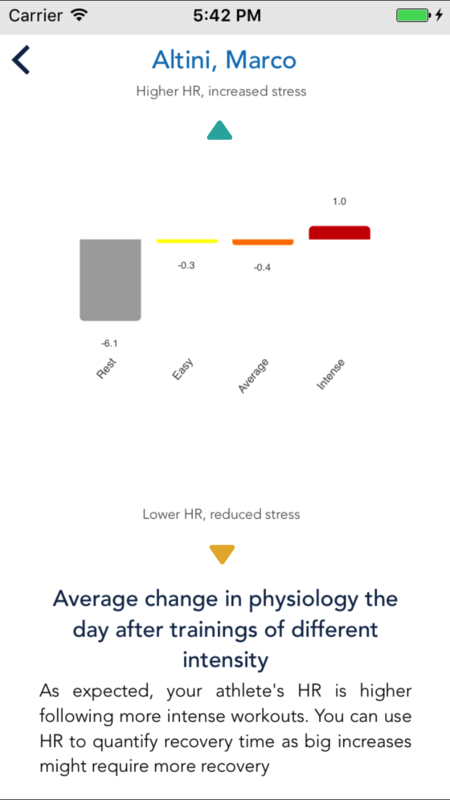 For these stressors we will not look at day to day changes but at the average HR or HRV values in the two conditions. What's your normal HR? Does it change when sick? See some additional screenshots above. 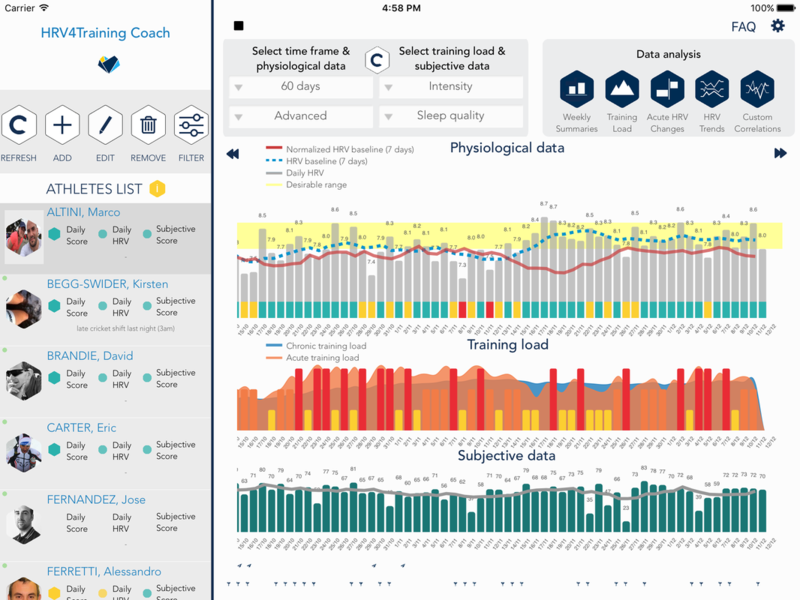 HRV4Training Coach can analyze multiple parameters collected over longer periods of time (weeks to months) to better understand the big picture and how your athlete is responding to your training program. Analysis of multi-parameter HRV trends is experimental and might change in the future. As of the current version of HRV4Training Coach, the analysis relies on the past 60 days of data to determine what physiological changes are non-trivial, and then combines multiple physiological parameters as well as training load, to determine te most likely physical condition pattern shown by your athlete. This feature will keep evolving as the platform acquires more data and we can develop better models. 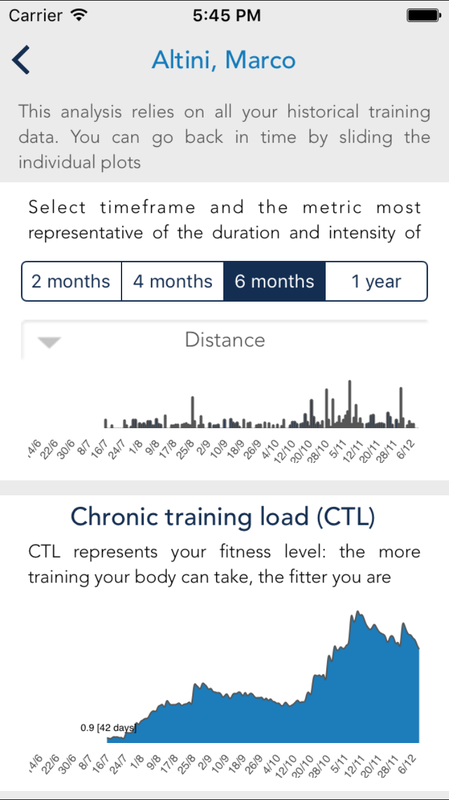 The training load metric displayed in the trends page can be selected on the home page, among the ones provided and annotated by your athletes (for example intensity, distance, RPE, etc.). Correlations are computed both on a day to day basis and on 7 days moving averages. 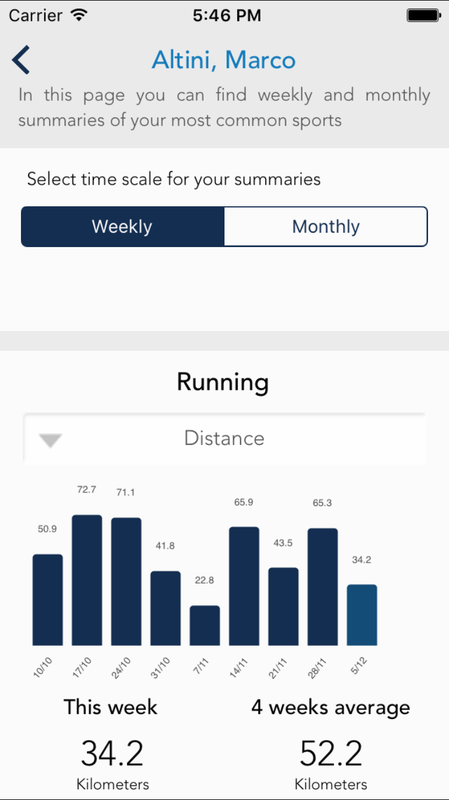 for runners using the Strava integration and training with a HR monitor, HRV4Training can estimate cardiorespiratory fitness level (VO2max). Check out this post for more details and our publication showing a strong agreement between real life running performance and estimated VO2max. This analysis allows you to get an overview of how hard your athletes are training and potentially polarize more their training, as a more polarized approach, typically involving training about 80% of the time at very low intensities, has been shown to improve performance for both recreational and elite athletes. More details on this analysis at this link. Settings allow you to configure what is displayed in the main screen (for example hiding travel, alcohol intake or other tags) as well as to export data and manage your subscriptions. 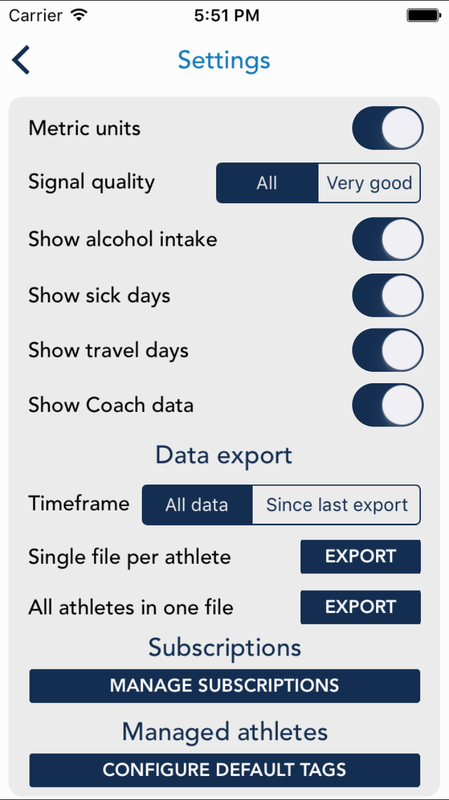 Data is exported as one csv file per athlete or as a single file for your entire team, including all measurements and tags. HRV4Training Coach requires a subscription. 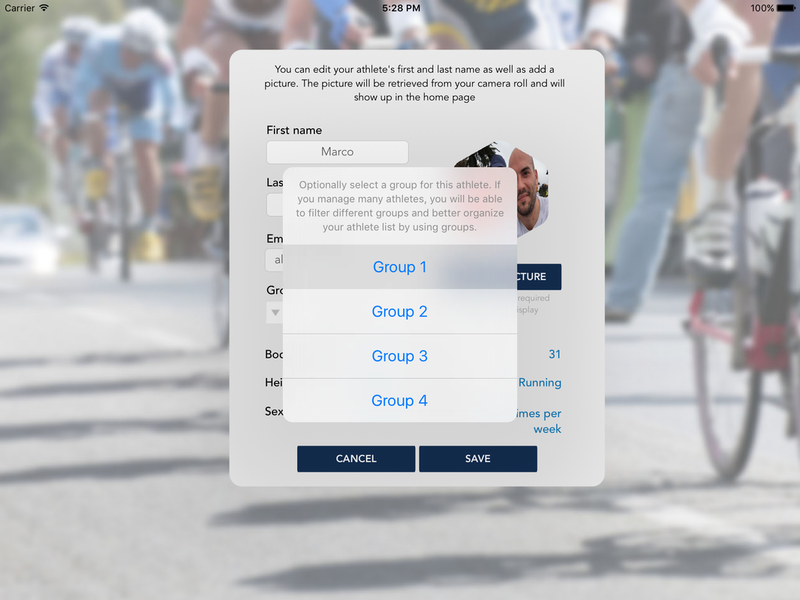 Subscriptions are handled via Apple using in app purchases and start at 4.99USD / athlete / month for a single user (+ a coach) and go down to less than 1USD / athlete / month if you manage up to 100 athletes. Subscriptions are valid for periods from 3 to 6 months and do not renew automatically. See the full pricing matrix inside the app. You can contact us for a free trial of HRV4Training Coach. Why is my athlete not receiving my data sharing request? Make sure the email address is correct. 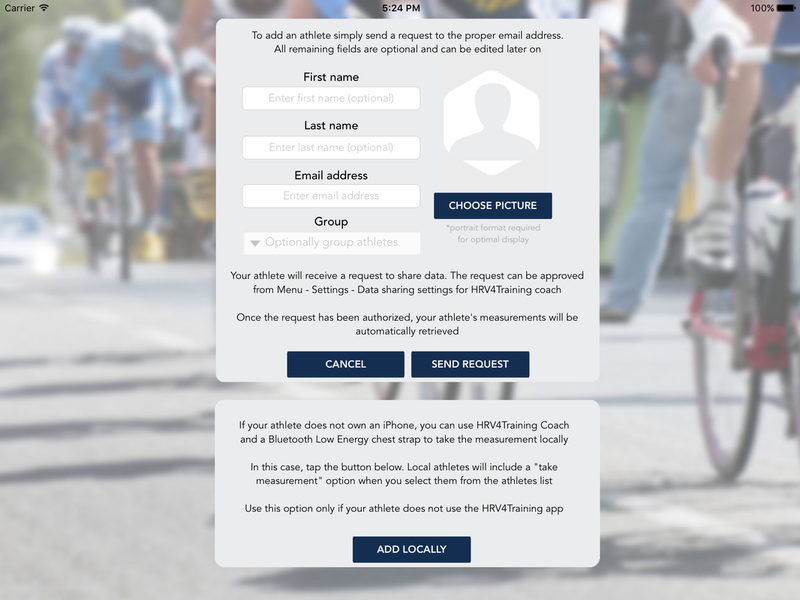 Ask your athlete to check under Settings / data sharing what email address he/she used for registration and make sure you are using the same email address when adding an athlete. If you are experiencing additional problems, please contact support. Why is my athlete's data not synched? HRV4Training sends data to the cloud right after each measurement. Periodically, the app will continue to synch if data hasn't been uploaded yet or has been modified. However, if your athlete's phone is offline when using HRV4Training, you won't be able to receive data. 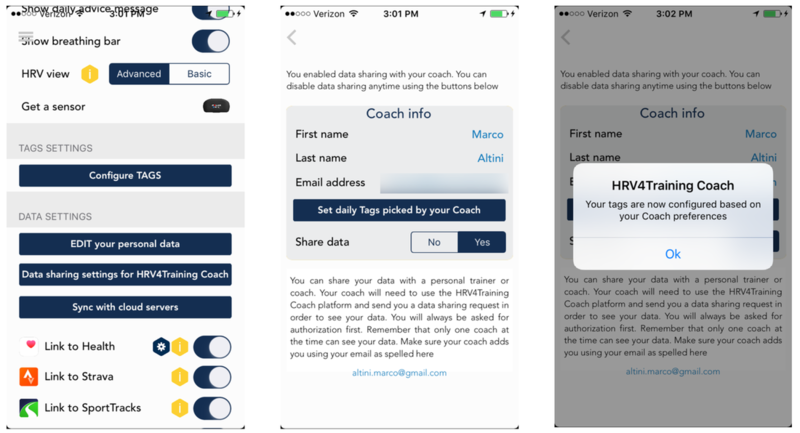 In this case, your athlete can manually push data by going under Settings / Synch with cloud servers and you will receive all the data that was not synched yet.